The Marina Bay Front had now become one of Singapore’s iconic landscape, with our high CBD office towers and buildings, upcoming Marina Bay Financial District, the upcoming Sands Integrated Resort, another iconic artistic landmark, the Esplanade. Today, the whole Bay marked a significant change in Singapore’s history. The Marina Barrage is officially completed and opened to the public, finally operational and this would provide Singapore with another source of drinking water a few years down the road and transforming our Bay into a vibrant city of water living and recreational activities. 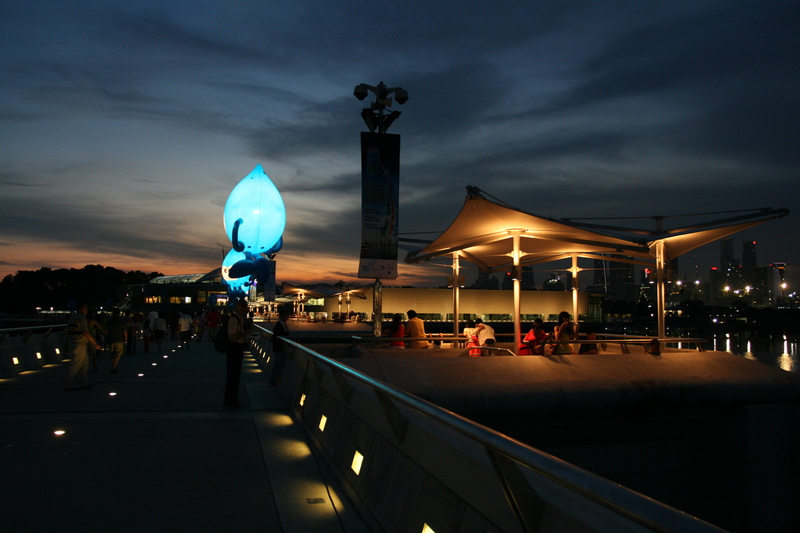 The Marina Barrage is our latest Water Icon and the vision of Singapore’s Founding Father, for greater details of the Marina Barrage, do drop by their official site ! It was not my first visit to the Marina Barrage because I ran across it during the Army Half Marathon ! 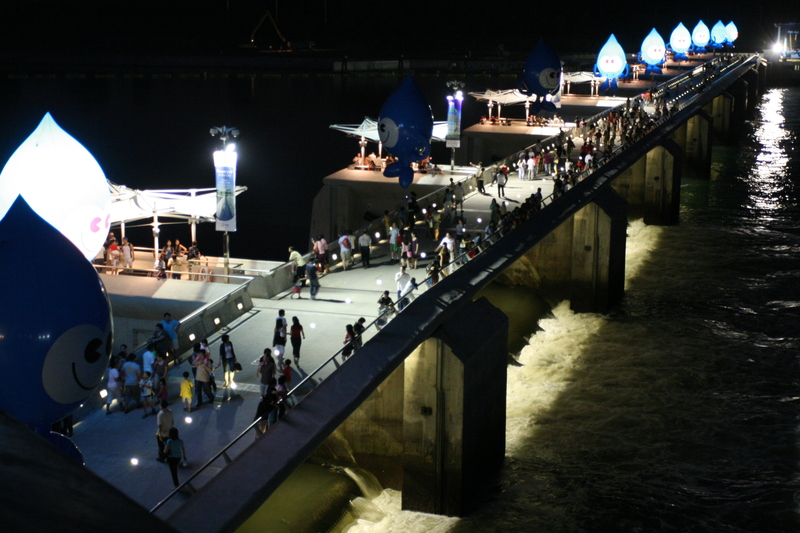 However, it was the Official Event today and there were many people dropping down to the Marina Barrage for a visit of Singapore’s latest water icon. There was quite a queue for the shuttle bus at the Marina South Station and thus quite a wait too. Finally, I decided to catch a bus service instead and walked a short distance. Upon reaching the Marina Barrage, it was lively with many people, they were simply to soak in the carnival, events, seminars and sightseeing. There were a number of photographers there to snap Singapore’s beautiful landscape, the Marina Bay Front. I met with James & Shirley, my old friends, after last week solemnisation ceremony. We walked along the dam and took photographs too ! Today was a good time to soak up the event and find good spots to take landscape photos, potential location for outdoor shoot too and of course, fireworks photo taking ! We also witnessed how the Marina Barrage would be operating when PUB opened up 3 of its gates and let the water from the Marina Bay out into the sea ! It was a great educational lesson to learn how a dam works ! Rest assured, I would be back to take more photos of the Marina Barrage and its surroundings ! It’s a beautiful city that I am living in ! Do drop by my Flickr for more photos of the Marina Barrage ! It’s very beautiful, when you come to Singapore, I can bring you around the places to visit and take photos ! Lovely photos. Looks like a great place to enjoy the scenery and sea breeze. Looking foward to you coming to Lion City for holidays ! Thanks for your kind comments ! It’s a nice place to visit, enjoy the scenery and sea breeze, looking foward to your photos and adventures there too ! Wow … I am attracted to that strange blue growing thingie in the dark! Amazing. Thanks for dropping by my site. I will take a more detail look in later days! Stay in touch! The ballon glows in the dark, emitting a bright blue light into the dark sky. Do drop by often, keep in touch ! what bas to take to go there?